The Cream Tea: should one put the jam on first, and then the cream; or the cream on first, and then the jam? The Devon cream tea specifies cream first, then jam, thus anchoring the cream on the scone firmly. The Cornish advocate jam first, then cream. Perhaps this is because they do not move the scone around much. I can vouch for the fact that if you gesture wildly with a Cornish cream tea, the cream can end up in any number of places, not least someone worthy lady’s decolletage. Felix asserted with zealous conviction that it is in fact against the law for someone to make a Devon cream tea in Cornwall. And vice versa. I should have applied the brakes, but my mouth was too full of scone, jam and cream. “I once saw this documentary,” he ventured, and we all took a deep breath. Evaluation, in these cases, is all, for he speaks with the authority of Archimedes himself, but not always with the same bedrock of factuality. The mental picture of the local Devon and Cornwall constabularies screeching up outside the house to arrest the offending cream tea maker was compelling. Felix did not miss a step. He knew he was rumbled. But his grin got much, much wider. I adjusted that mental picture of police cars to police boats. The historians can trace the term as far back as Cambridge satirist John Eachard’s The Ground and Occasions of the Contempt of the Clergy, published in 1670. It is a book lampooning the style of address used by clergy and politicians. The author’s father was a clergyman. If a sermoniser uses constable’s talk, Eachard says, he is thought honest and well-meaning but not bright. But if he ‘soars aloft in unintelligible huffs, preaches points deep and mystical, and delivers them as dark and phantastical” then he is thought most able. Tall words, he says, are what dazzle; tall words and lofty notions. The tall tale: an art, used carefully. Take Alfred Bulltop Stormalong, the American folk hero: beached in New England as a baby he got a job as a watchman on a ship. He left sea to try his hand at farming and ranching but circumstances discouraged him: he ended up returning to sea, and attracting acclaim for his activities. Thing is: he was five fathoms – 30 feet, to you landlubbers – tall. His ship was so long the men had to use horses to get from one end to the other. and its mast was so high it had to be folded down to let the moon pass by. His battles were with tornadoes and ancient sea creatures. A myth, old Stormalong. The tallest of tall tales. The gandiloquent tall tale is a gift. But best not tell too many; or the edges between tale and truth might blur. Posted in Quirks of History, Shrewsday MansionsTagged Alfred Bulltop Stormalong, Cornish Cream tea, Devon Cream Tea, John Eachard, Tall Tales, The Ground and Occasions of the Contempt of the ClergyBookmark the permalink. I know – nor me. It would not do to get on the wrong side of the Preserve Police. 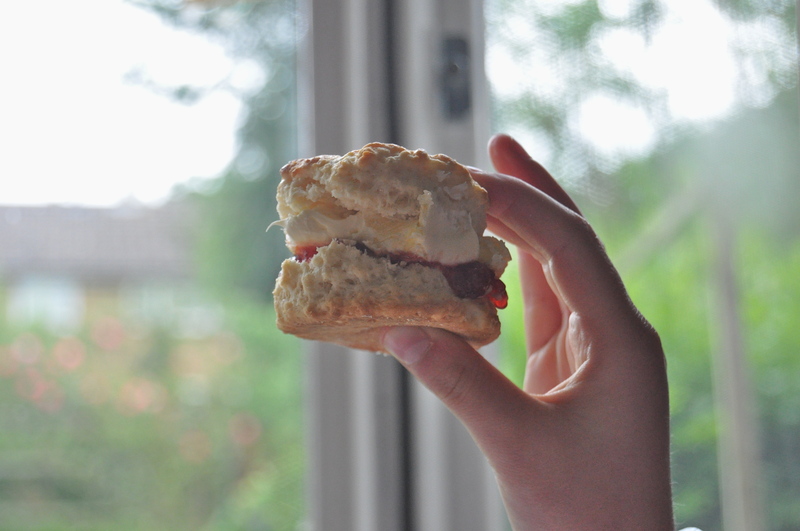 are cream (and jam) scones a tall tale? John Eachard’s book is well worth a read for that very reason, Roger! Nor can I. I’ll have to keep checking this blog. It does. I must stop thinking about it quickly before I go and eat one 😀 Hi, Wannabearchitect- thanks for commenting today! Great stuff – my mum used to make lovley Scones. They’re easy and quick, and visitors love them, Jim. Now, the safest thing is to avoid cream teas! Felix’s tale is true when it comes to licencing laws and small independent states on the Continent. No, I am of your opinion, Col 🙂 However I may watch my jam and cream from now on. Don’t want to alert the cops. where I come from: butter, jam then cream. Heavenly! Always the peanut butter first and then the jam…heavenly! Bravo to Felix for his budding penchant for story telling, don’t confuse him with the facts. “I believe that imagination is stronger than knowledge – myth is more potent than history – dreams are more powerful than facts – hope always triumphs over experience – laughter is the cure for grief – love is stronger than death” – Robert Fulghum. What beautiful words, Lou 🙂 And peanut butter and jelly – I hadn’t make the connection! Of course the same principles apply! Cream first or last either way they are a delicious concoction, but it must be strawberry jam with Devon or Cornish clotted cream for me. Felix has definitely inherited your story telling gift. 😀 Yes: he’s inventive, all right, Rosemary. And he does love a cream tea. Perhaps the debate ends here? This dictates that the cream goes IN the scone: http://smittenkitchen.com/2006/11/dream-a-little-dream-of-scone/ 🙂 I’d guess Felix and Maddy may both follow in Mom’s footsteps when all is said and done! Aha, I live with a tall man who tells tall tales, only thing is that after a while he starts to believe in them. tee hee Felix is quick on the retake and will do well for it in life. I imagine such lively teas at Shrewsday Manor. The tale is a gift but the clotted cream, more so. I’m not that familiar with scones or tea, but what I see in that photo is exactly what I need to go with the cup of coffee I’m enjoying at the moment. Looks divine! Love this: Evaluation, in these cases, is all, for he speaks with the authority of Archimedes himself, but not always with the same bedrock of factuality. Indeed; as we are always saying, why let the truth get in the way of a good story? Aren’t there rules for tea as well? If I brew it in a pot, I pour my cream in the cup before I add the tea, because it stirs the cream around better. But, if I brew the tea in the cup, then I add my cream after, because it cools the tea and dilutes the brew. Felix is destined to be an attorney. Definitely. Oh, don’t get me started on tea, Andra 😀 The rules surrounding tea are complex indeed. And different for each blend. I remember the young bucks at university would impress their women by inviting them back to their rooms….only to be confronted with a bewildering array of blends of tea. Even more bewildering was their encyclopaedic knowledge of how to serve them: tea, no lemon, no milk, milk in last, yada yada yada…. A comically British art of seduction. I wonder if tea ever got anyone into bed. Dear Kate, I laughed out loud–a belly laugh and that’s not a tall tale–when Felix shifted gears so adroitly and said the man sat in a boat in the middle of the river. Oh the delight of it! Peace. I know, Dee: only an eight year old boy could have achieved the lightning shift 😀 Aided by an impish grin. Your grandmother sounds brilliant, Debra. The Americas seem to have a special place for the tall tale: and when I read them, I can almost hear them being read out. They are auditory delight. I should have had my Audioboo up and running, shouldn’t I? No offense intended, but I wish I hadn’t chosen to read this post. Because now I have cream tea firmly in mind, and I don’t have anything resembling that in the house, which is a good thing for my health and well-being, but I can’t stop thinking about scones and jam and cream, in no particular order. And I’m hungry, but a fruit plate will not answer. Quickly getting off that topic–I’d never heard of Alfred Bulltop Stormalong. Guess I haven’t spent enough time in New England. Thanks for introducing us. As for Felix: If he ever decides to move to the U.S., he would find wonderful opportunities in the field of politics. And I love the idea of folding down the masts so as not to pierce the moon. A tall tale indeed.